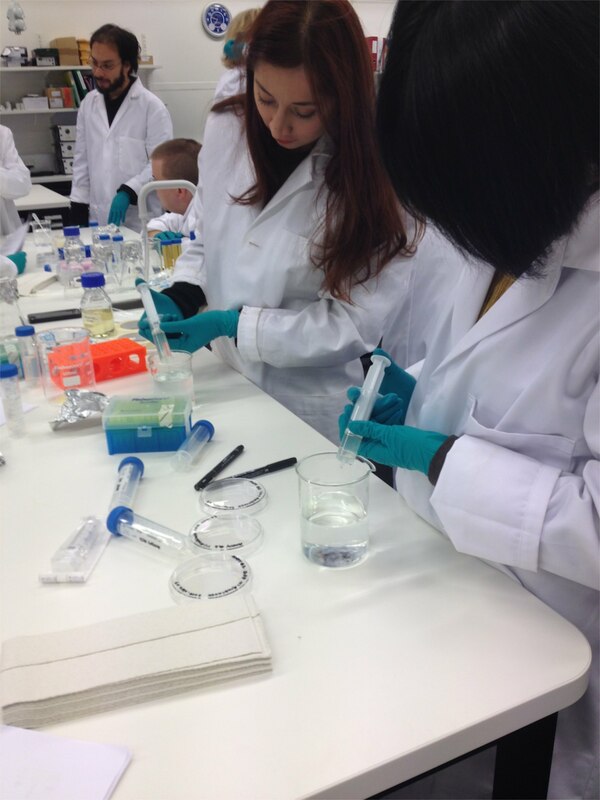 This practical session featured a novel biotechnological technique for encapsulation and immobilization of cellular organisms, using sodium alginate to form beads which would hold cultures of E. coli bacteria. The nature of the materials used also allows these enclosed environments to interact with each other. The workshop also encouraged theoretical considerations of the concept of encapsulation within the biosciences alongside the coupling of organism and environment. Owing to the incubation/waiting periods within the protocol, time was available to engage with these themes and other related narratives and discussions pertinent to the practical and conceptual arguments of the session. Following a presentation which introduced us to the two protocols "shine a light" (using a GM glow in the dark strain) and "lethal encounter" (a mixture of GM and wild type) we proceeded to suspend the bacterial culture in the alginate solution and create the beads by syringing it, painstakingly drop-by-drop into a calcium solution. Each bead is a micro-ecosystem - not membranous with liquid inside, but more like a gel, a matrix. The beads are then placed into the various nutrient solutions - some of which containing inducers and some antibiotics. The reactions of the combinations of the wild type and the GM will vary depending on which media they are cultured in. The beads - which are now nano petri dish ecosystems - are left in this aqueous phase with the nutrients for some 30 minutes to allow take up of the media. After this they are subjected to the hydrophobic phase which pretty much seals the bead against further interactions with the outside world. When this stage is complete the beads are poured into petri dishes and taken away for incubation. Shine a Light - the beads that will have physical contact will fuse with each other and the inducer will diffuse within both beads. The cells that were initially grown without the inducer in bead A will also become fluorescent thanks to the interaction/exchange with the other bead B. Lethal Encounter - the beads that will have physical contact will fuse with each other = the antibiotic will diffuse within the bead carrying the wild type strain = the ‘natural’ E.coli will die due to the interaction with the environment of the GMO strain. After this hands-on session we continued with a lecture by Martin Hanczyc who's a Principal Investigator in the Centre for Integrative Biology (CIBIO) at the University of Trento, Italy. The research of the Hanczyc Lab is focused on understanding the fundamental principles of living and evolving systems through experimental science. To this end, he builds synthetic systems where dynamic life-like properties emerge in simple chemical experiments. "Like other sciences, synthetic biology must proceed from the simpler to the more complex, beginning with the reproduction of the more elementary vital phenomena." "Protocells" can be considered a bottom-up approach to synthetic biology. The term first emerged in the context of research on the origins of life and artificial life research in the 1930's. Martin defines protocells as "a simple artificial prototype of a living cell with one or more properties of life". Martin mainly focuses on dynamic droplet systems. The first experimental setup seems to be very simple - it's just a dish of olive oil and droplets of sodium hydroxide (NaOH) solution with some food coloring. This setup can be considered a typical water-and-oil system or so-called "Bütschli" system. Otto Bütschli first described the system in 1898, when he used alkaline water droplets in olive oil to initiate a saponification reaction. We can see the droplets deform and slowly break up. In the microscopic view we can even see some life-like behaviour emerging from the chemical-physical phenomena. Another experiment is about droplet chemotaxis. It's basically the same experiment as before, just that additionally, a drop of NaOH solution is added to the experiment. The droplet becomes some kind of "pH sensor", which "reacts" to its environment depending on the different pH levels. The droplet senses the NaOH solution, approaches it and even "climbs" to the point of highest concentration. This can be actually compared to biological chemotaxis, for example when bacteria move to an area where food, e.g. glucose has been added. Competing flows and movements within the protocell can sometimes even lead to cell division, a probabilistic event that sometimes happens and sometimes doesn't. To summarize, droplets are dynamic when loaded with chemical potential (energy) and far from equilibrium. Life-like behaviors emerge such as self-movement, chemotaxis as well as rudimentary replication cycles. Talking about the origins of life in relation to protocells, Martin references to the well-known Miller-Urey experiment from 1953, in which a diverse mixture of organic compounds emerges from inorganic starting materials, generating some kind of "primordial ooze" which is too difficult to fully characterize. So instead of using pure chemicals, Martin also made some experiments in which he uses tar-like material to create protocells. To be more precise, he uses HCN polymers which were developed similarly to the sludge produced in the Miller-Urey experiment. The protocells created from that "messy" material are also able to move around and to sense their environment. This refers to a hypothesis about the origin of life called "maximalism". Instead of assuming that life started simple and became more and more complex (monomers > polymers > self-replicating structures > evolving cells), the maximalism hypothesis states that in the beginning, there was a complex tar-like substance from which the less complex monomers developed in the first place. 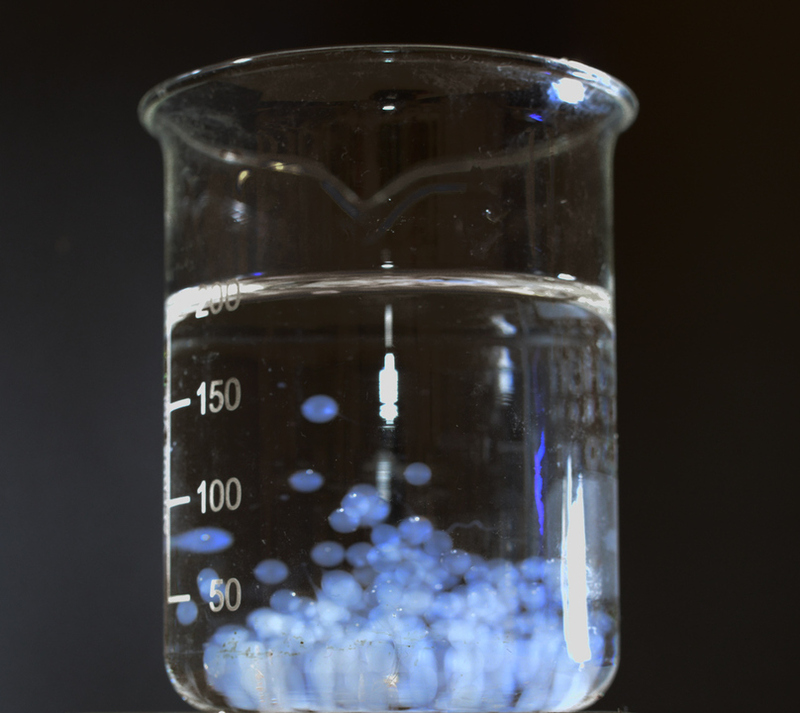 The last video shows droplets created from HCN polymers made in Martin's lab which demonstrate movement and chemotaxis.